This recipe for Soft Lavender Sugar Cookies was a prize-winner at the Lavender Fair in Alum Creek, WV. The judges liked the extra burst of lavender flavor that came from pressing a few lavender flowers into the top of the cookie prior to baking. Bring first 2½ cups of water and sugar to a boil. Remove from heat. Stir in lavender and let stand for about an hour. Strain syrup through cheesecloth or fine colander to remove flowers. Stir in second amount of water and lemon juice. Serve over ice. Add 1 teaspoon lavender flowers and four teabags or green or black tea to teapot. Add four cups boiling water and steep for five minutes. Meanwhile, in small saucepan, bring 2 cups of water and ½ cup of sugar to boil. Stir until sugar dissolves. Turn off heat. Add two cups of ice cubes to a large glass pitcher. Strain brewed tea over ice. Stir in sugar syrup. Serve in tall glasses over ice, garnished with a sprig of mint or lavender. You can also add 2T. lavender flowers now or press them in later on the top – your choice. Fill a small bowl with cold water and a flat dish with 1/2c. lavender sugar. Wet your hands and shake off. Place heaping spoonfuls of dough in your hands and roll into 1 1/2 inch balls. Place on parchment lined baking sheets 2 inches apart. Don’t crowd. If you wish to sprinkle the cookies with lavender sugar, then plan ahead; to make it, you can simply add sprigs of lavender or lavender blossoms to sugar and let stand several days (or see alternate recipes for Lavender sugar, below). Use the butter wrappings to lightly coat a flat-bottomed glass and dip the glass in the sugar. Press down the cookie balls by half to 3/4 inch high. Press on about 8 lavender flowers now if you didn’t add them to the dough. Sprinkle a scant bit more sugar over them Bake at 375 degrees for 5 minutes, reverse the sheets and bake 6 minutes more till outer edges are slightly golden and the centers are slightly puffed. Cool for 3 minutes before removing to racks to allow them to harden up enough not to crumble. Cool completely before sampling (this is hard to do). The original recipe(without the lavender) came from Cooks Illustrated several years ago. The important thing to me was that they were trying for a soft sugar cookie. They found that beating the soft butter and sugar together for exactly 3 minutes was the secret to getting good results. I have since used this technique on other baked goods with excellent results..
Mash the lavender and blueberries in a deep non-reactive pan. Add the liquids and bring to a boil. Remove from heat and let steep 20 min. till it reaches a rich color and tastes of lavender. Strain through a jelly bag and return to cleaned pan. Add the pectin and butter and stir to dissolve. Bring to rolling boil, stirring constantly, for one minute. Add sugar all at once, stirring constantly. Bring back to boil and boil 4 minutes. Have hot sterilized jars and lids ready and fill to within 1/4 inch of the rim. Cap and tighten. Rinse off spills. Label when cool. Bring the sugar and water to a boil, stirring constantly till the solution clears. Cool. Add the rest and put in a clean half gallon glass container. Let stand for a month. Then strain and bottle in pretty bottles for gifts. 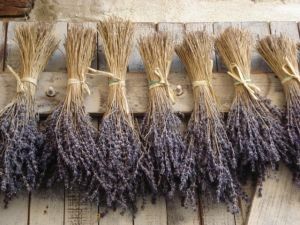 If you want the liqueur stronger for cooking, add a sprig of fresh lavender flowers or a pinch or two of dried blossoms. This is good with fruit dishes or anything lemon. Use in lemon cookies, breads, and cakes.